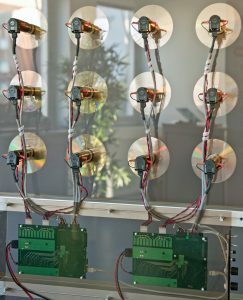 To demonstrate the capabilities of an FPGA-based motor control Unjo has built this rig running 12 DC motors all controlled by one FPGA-chip. The motors can be driven individually with different speed and direction which is demonstrated in the following film sequence. See how our demo unit operates! The demonstration PCB used here, can also be used to build a conceptual prototype, and is also used for products in series production.Various motor types and sizes can be used, and also mixed freely. To run multiple motors is demonstrated b y many, but behind the fancy models hides often a large electrical cabinet. The Unjo solution is extremely compact – you see the whole system on the photos. The reason for having two PCB’s is that each PCB can handle 12 phase outputs. The second PCB is just a slave, all controlling is done from the FPGA on the first PCB and communication between the cards is done over Ethernet. As a follower on Linkedin you get the latest news before anyone else, so become a follower and don't miss any important updates.